Wouldn’t we all love to spend a romantic day, like Valentine’s Day in Provence, snuggled up by the fire, listening to the Mistral and sharing a few glasses of Provence Rosé, especially because pinks are quite romantic and will remind you of the happiness of last summer. Well, this menu aims to get you as close as possible to a romantic Riviera break and a good bottle of Rosé, preferably ours :-) It would be a suitably dreamy choice to get your evening à deux off to a very smooth start. There are lots of considerations for food for a romantic dinner date – nothing too spicy, smelly or heavy, after all you don’t want to feel like a beached whale, but still something luscious and out of the ordinary to make your beloved feel special. I have opted for a bit of the earth and the sea, a bit of forest and fowl and then a creamy coconut and summer berry finalé to end on a real high. All of it eminently achievable in terms of basic cookery skill level and the inevitable shortness of time. 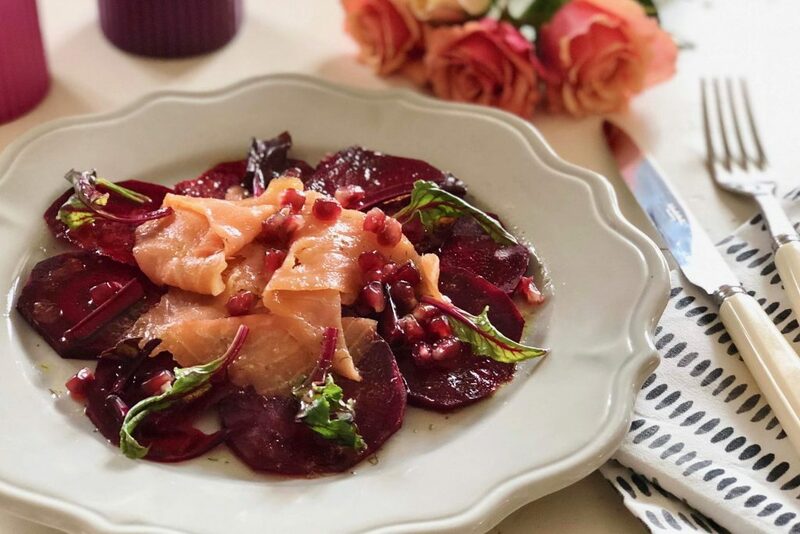 Thinly slice the raw beets and arrange in a flower shape on your plate. Tear off pieces of the smoked salmon and add over the top. Then halve your pomegranate and extract some pomegranate seeds with a pointy knife (use the rest for tomorrow’s breakfast) and sprinkle over the plate. Chop the dill and mix with a small spoon of honey mustard, lemon juice and olive oil, until you get a relatively runny consistency. Lightly season with pepper and salt (remember the salmon is already salty). Spoon the vinaigrette over the dish, making sure you reach the beetroots on the outside. Pour both of you a chilled glass of Mirabeau and serve! We’ll start with the mash, because it can easily be made in advance. Peel the potatoes and cook until floury, reserve the cooking water. Put the cooked potatoes through a ricer or mash by hand- the smoother the better. Cook the polenta in the reserved cooking water, making sure it’s tender- you want a creamy consistency, so add more water if you need. Add some olive oil, a dash of milk, a knob of butter and salt and pepper, as well as some of the creamy polenta. Mix thoroughly and adjust the consistency with milk (or stock if you’re non dairy) to make sure it’s not too solid- set aside or keep warm on very low temperature. Slice the mushrooms and pan fry with lots of thyme and a bit of olive oil (pick off the ends, no sprigs please). This should only take a few minutes. Add a couple of spoonfuls of Mascarpone on a low flame. Turn off heat and set aside. Turn on fan oven to 160 degrees Celsius/320F. Pan roast the chicken breasts to brown on each side (don’t cook through yet). Remove from the pan and carefully slice open the breast lengthways, not all the way to the ends or through to the bottom, to create a pocket. 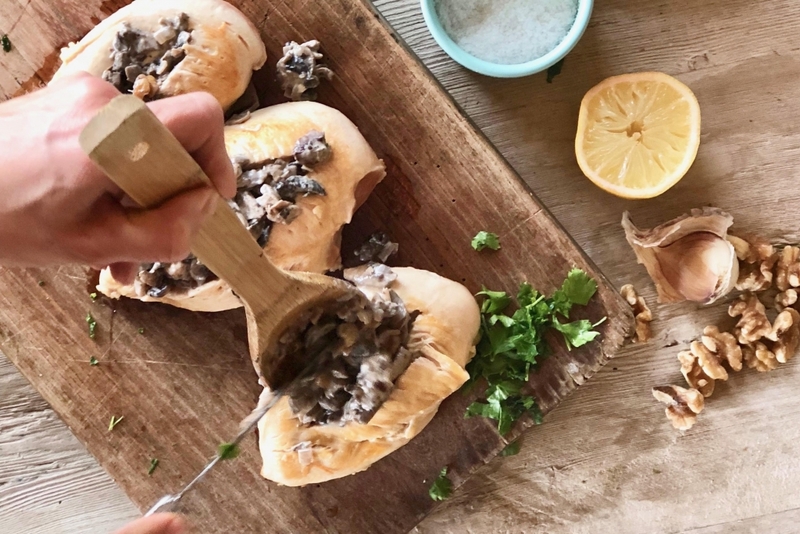 Fill the pocket generously with the mushrooms and sauce, season to taste. Put it in the oven for another 10 minutes to cook all the way through, turn down the heat to 70C/150F if you need to keep it warm. Cook some leaf spinach, making sure to discard any water at the end, you don’t want your food to float in green sauce. Gently reheat the mash if necessary. 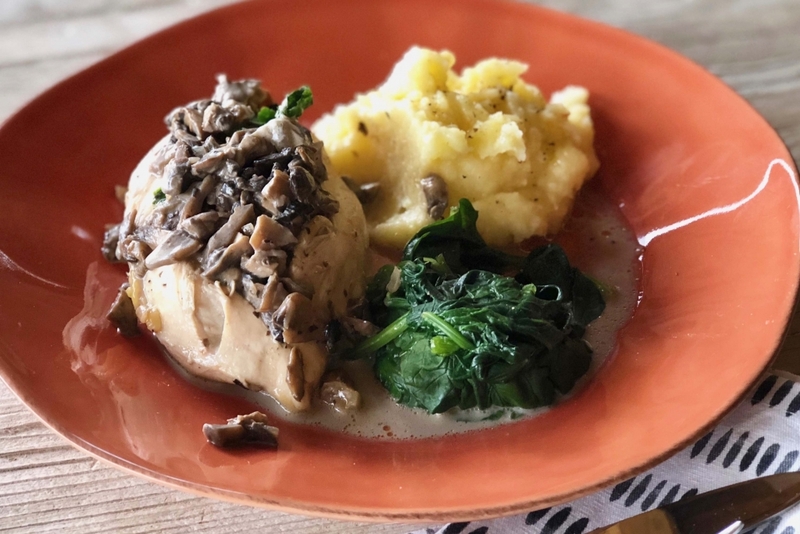 Warm the plates if possible, lukewarm food is always a bit of a turn off, and arrange the chicken with a spoonful of the mash next to it and a little heap of wilted spinach. Second or third glass of Rosé is now in order! Whip the cream until really stiff, then fold a couple of tablespoons of the coconut cream. Add some broken up meringue and raspberries. 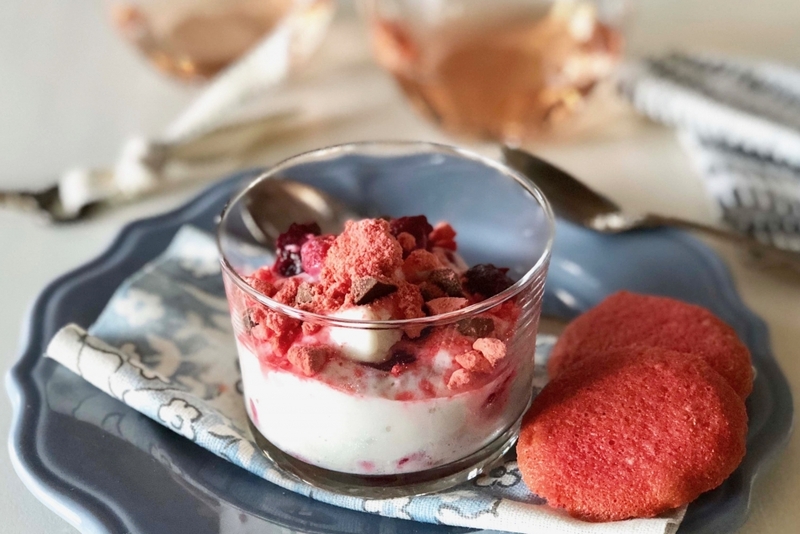 Hopefully it will not be too runny..You should find some beautiful marbling from the raspberries, but make sure you don’t stir it so vigorously that it becomes too homogenous a cream and loses its fluffy texture. Using a knife shave some bits off the chocolate to add later. Gently spoon the mix into a glass, decorating with a raspberry or two at the top, sprinkle over a bit more of the crushed meringue and the pieces of chocolate. Put in the fridge immediately. Serve on a nice plate when the moment’s right and decorate with a pretty biscuit if you have one. We really hope you enjoyed this menu on your romantic evening, but you can of course make all of these dishes for many other occasions too.